The Tories have renewed calls for an independent London bombings inquiry after a report said the Home Office had found no direct link to al-Qaeda. A narrative by a senior civil servant will say the attacks were planned on a shoestring budget and not by a global terror network, the Observer reported. Tory shadow homeland affairs minister Patrick Mercer says an independent probe is needed to avoid a "whitewash". But the government has said it would divert police and security resources. The Observer claimed that the official narrative will say the attacks were carried out by four men who had scoured terror websites on the internet, and who had no direct support from al-Qaeda. Mr Mercer said: "The leak suggests that the government's narrative on the July attacks is going to make no connection with international terrorism and al-Qaeda - I find that very hard to believe. "A narrative from the government is going to come from the same sources that provided us with the dodgy dossier over Iraq. "This is why it is so important that we have an independent inquiry and not just another government whitewash." Victims' representatives, opposition MPs and Muslim leaders have said an inquiry is needed for lessons to be learned. 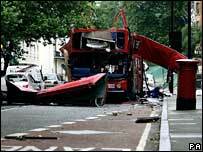 Prime Minister Tony Blair has previously said the narrative will include all of the evidence held by the government. He said: "I do accept that people want to know exactly what happened. We will make sure they do. "If we ended up having a full scale public inquiry... we would end up diverting a massive amount of police and security service time and I don't think it would be sensible." Mr Blair also said that what happened was "essentially" already known, and that there were numerous inquiries by MPs' committees.